Some of the most common things I do are: importing a background image to trace, creating lines for satin or running stitches, creating areas (including holes) for either applique or fill patterns. Sometimes I use “columns” when I want satin stitches that are not uniform in width. I also need ties and underlay. Lettering is also a must have. 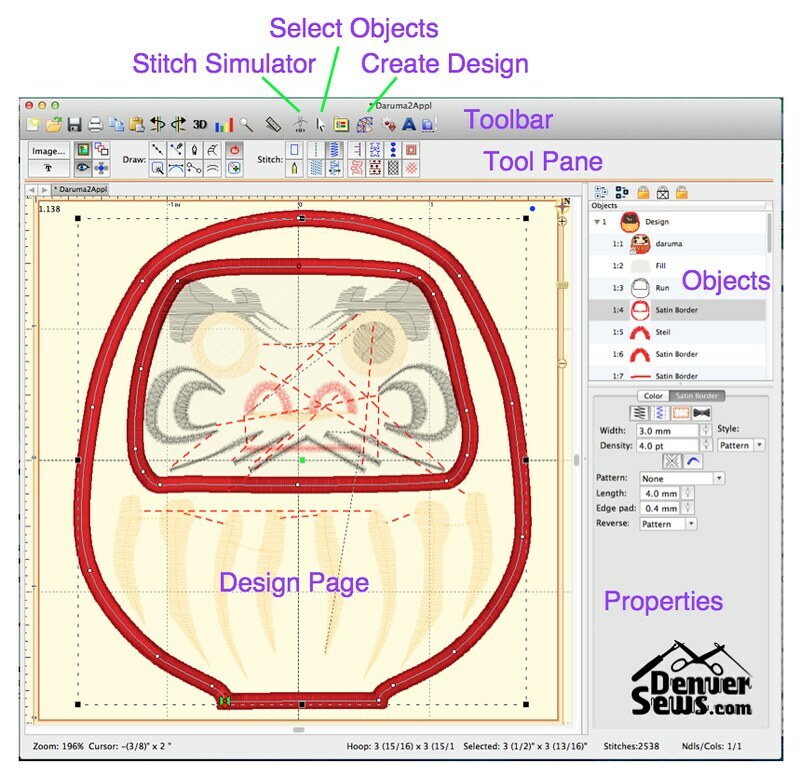 The Stitch Artist screen is largely divided into four areas: the Design Page, the Objects pane, the Properties pane, and the Toolbar / Tool Pane. The Design Page is where your overall design is shown. The Objects pane contains a list of all stitched “objects”. An object can be a background image, a line or shape that you have not converted to a stitched object, or a stitched object such as a filled region. 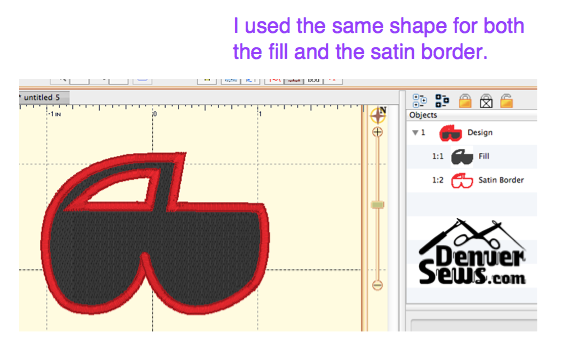 The Properties pane lets you change various aspects of the selected stitched object, such as the color or the width of the satin stitch or the fill pattern for a region. The Toolbar lets you switch back and forth between the Design Creation mode and the many other modes that Embrilliance has supported for a long time. I tend to digitize items in the order in which I want them stitched. 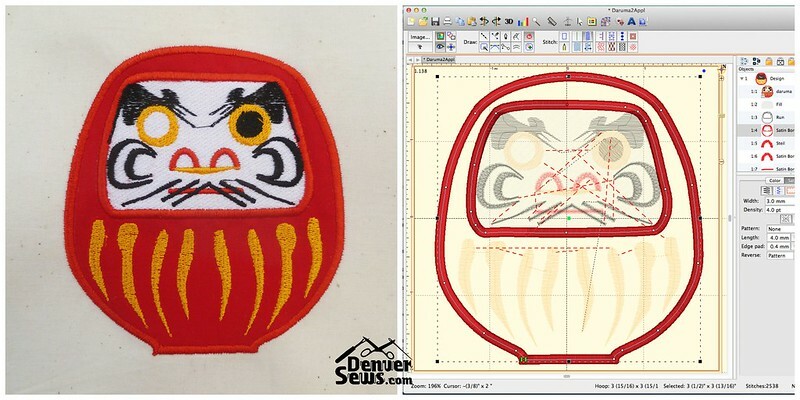 For this little exercise, I chose to create a design from a daruma image from jadedragon.com for my own personal use only. I decided that I would stitch the white face first, followed by the red body using an applique, followed by all of the remaining body and face details. I would minimize the number of thread changes by stitching white, red, gold, and black in that order. You might notice that I chose a different color for my applique tack-down line (black). This was simply to force my machine to stop for a color change. Stitch Artist does let you reorder objects quite easily in the Objects pane, but it’s always nicest to get the order roughly right the first time. As with most digitizing software, everything starts with lines or closed shapes. For my purposes, I will say lines are not closed and shapes are closed (like a star or a circle). Lines are turned into running stitches or satin stitches (zig-zag). Shapes can be used like lines or can be turned into filled regions. You can hand-draw lines/shapes or you can select from a library of shapes. My husband was interested in using some of the badge-shaped shapes provided in the library. I hand-drew all of my lines/shapes for my daruma. The manual discusses drawing in great detail, but it’s really not that hard. 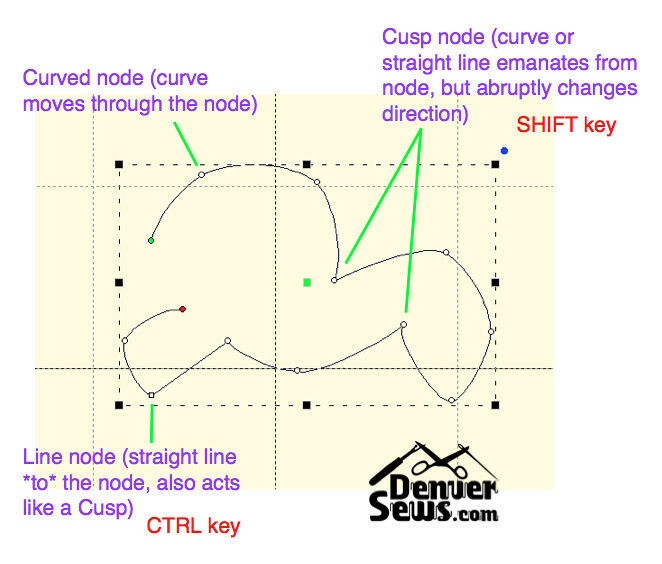 Enter your nodes first, trying to minimize the number of nodes, and then reshape the lines using the Bezier handles. Holes are one of the coolest things you can add to your filled shapes. 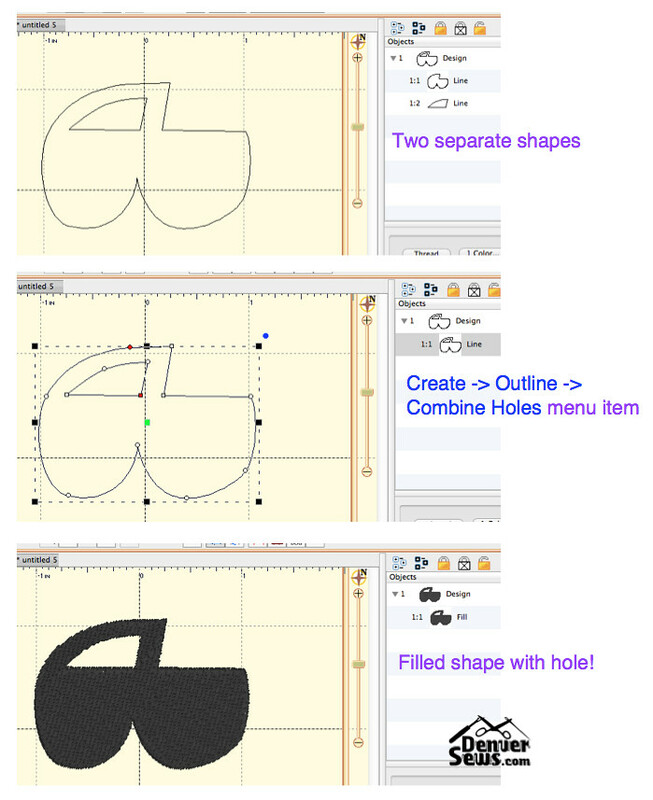 Stitch Artist makes this easy by allowing you to draw each shape separately and then combine them via the Create -> Outline -> Combine Holes menu item. You can also use the Add A Hole button, but I prefer using the menu item. See pg 115 for a discussion of holes. The underlay options for filled objects are pretty basic: perpendicular (90 degrees from main fill direction), diagonal 1 (45 degrees), and diagonal 2 (-45 degrees). All underlay options are basically a running stitch that zig-zags back and forth behind the main fill stitch. You can set how far apart the zigs and zags are and how far away from the edge of the drawn shape they should lie. You can see the effect of the different types of underlay by using the stitch simulator. You can also use any combination of the 3 options or none at all. For satin borders and columns, there are four underlay options that. Again, you can see what each option does by using the stitch simulator. (A column is essentially a variable width satin stitch). This confused me initially. If you’ve created an object and you want to mirror it, you need to get out of Design Creation mode and into Object Selection mode. From there, you can mirror your object. Layering an object means using the same line or shape for multiple purposes. 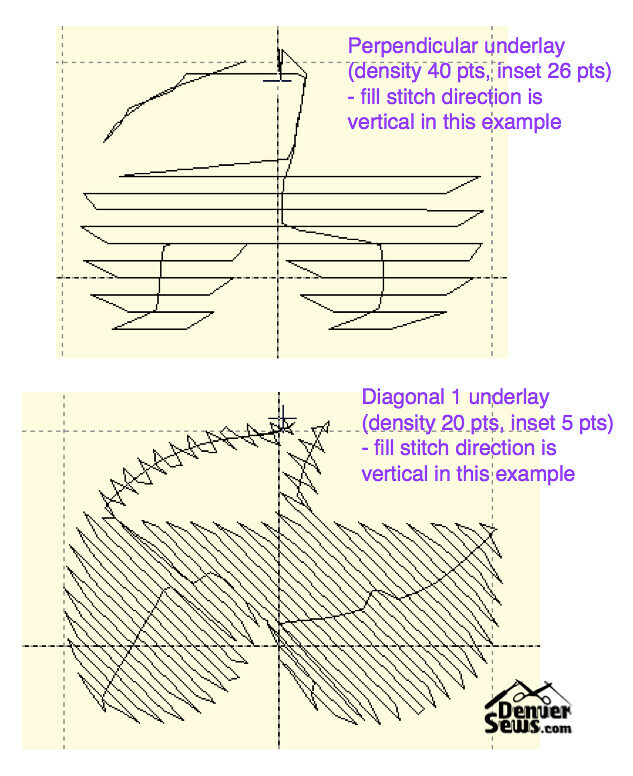 For example, if you want your filled object to also have a running stitch outline, you need to copy and paste your shape so that you have two copies. The first copy is for the fill and the second can be used for the running stitch outline. There are two ways to enter text that I can discern. You can use the “ABC” button on the top tool bar and use the built-in fonts. This allows you to do such things as put the text on an arc. Or you can use True-Type fonts in the Create Design toolbar to extract the *outlines* of individual letters as shapes. Once you have the shapes, you do whatever you’d like with them. You cannot, however, put those letters on an arc like you could with the built-in fonts. It is my understanding that you can add built-in fonts to Embrilliance, but I am much less familiar with this process. Stitch Artist L2 is quite young and is still a little buggy. However, I am really impressed with its ease of use. It may not have as many underlay or pull-compensation options as other much more expensive software packages may have, but I believe it is wholly adequate for most purposes. I love how easy it is to enter in lines and edit them. Adding holes to shapes is much easier when you can combine individually drawn shapes. And the fact that the program is so uncomplicated, in some ways, makes it easier to be creative about how you can use and reuse paths for different purposes. You can see an example of that here (forum). I love that you can run the software on Macs and PCs. I love that I can have multiple copies of the software on different machines without using a dongle. I love that I can still create ScanNCut files. I love that the support staff is *extremely* responsive to questions and problems. I love that Embrilliance offers a 90-day money back guarantee. If you’re interested in learning more, you can download the manual here. I’ll be hanging onto this software and I expect my husband to start making his own patches very soon. Previous The “I Saw It In Threads Magazine” Challenge! I bought Stitch Artist 2 & Essentials a few weeks ago. My Palette software would not work on the new 64bit computer. My first Palette was #1 quite a few years ago. I decided to switch to Embilliance, and I am glad I did. I love the software. I use to sew clothes for myself and family as MS progressed I began computerized embroidery. I use a Baby Lock Elegante. Thank you for this blog it is nice to know other sewers in our area. OMG… New to digitizing software. I have been trying to two days to get a square box. Watching youtube videos of Level 1, nothing mentioned about ctrl key. Your review was exactly what I needed to know. These reviews are really starting to get to me. I actually have a book now on tips for machine embroidery. I’m thinking a embroidery machine may be in my future. I hope so! I think you’d enjoy it. Thanks Brian – you’re doing a good job at BriTon Leap! Excellent review, very informative. Well done, Lynne!